Whether tomato plants are grown from seed or purchased already grown, they may need to be hardened-off before they can be planted outside in the garden. Hardening-off is the process of gradually acclimating plants to the harsh reality of the outdoors in order to minimize plant stress when they are planted into the garden. Please note: I don't harden off tomato plants that are going to be planted inside my plastic-covered beds. The first day, set them outside for one hour, the second day, two hours, three hours on the third day and so on for two weeks. At the end of two weeks, they will be fully acclimated (or hardened-off) and ready to plant outside. It's best to harden-off tomato plants in a place that is not in direct sunlight and that is protected from wind. It's also important to make sure they are kept hydrated. You will notice that they need more frequent watering during this process. 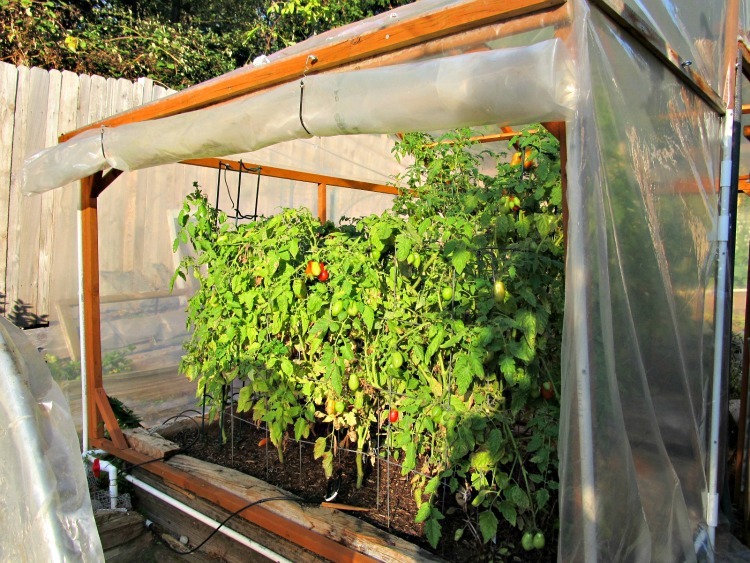 Since my tomato sauce garden is a plastic-covered, raised tomato bed (such as in the photo above), the plants do not need to be hardened-off. They will be gently acclimated to the outdoors as I start opening the plastic on the sides during the day to let air flow into the bed. That reasoning works for me, and in practice, seems to actually be working for my tomato sauce garden as well. I put tomato plants into the ground at least one full month sooner than most gardener's in my area thanks to the plastic covering. I don't raise the sides to let air inside until I see blossoms on the plants and the temperatures have become consistently warm. So, in my opinion, whether or not to harden-off really depends on how you set up your tomato sauce garden.